These days machine made rugs have a lot in common with wall-to-wall carpeting. There is a great deal of machine made rugs available to consumers in all types of styles, colors, sizes, textures and patterns. However, handmade or hand knotted rugs are really in a class of their own. Many of these rugs are antiques but they are still also being made today. Before selecting either a machine made or handmade rug it is important to understand the differences between them so you make the right decision for your home or office. Machine made rug varieties are very affordable textiles to add style and or design to your space. Typically these rugs are not long-term investments; however, some end up having great sentimental value to a consumer. Machine made rugs are woven on a computerized rug loom where the colored yarns are woven into a backing material. The benefit of purchasing a machine made rug is the overall cost of the item as well as getting the feel of a more expensive handmade rug. Some machine made rugs can even be impervious to water and mold making them ideal for usage in outdoor living spaces. The negative quality of machine made rugs is that they will not wear as well as a handmade rug will. Handmade rugs, also referred to as hand knotted, are beautiful investments to accentuate any space. Because these rugs are literally made by an individual weaver they can have many inconsistencies depending on the skill set of the weaver, but this is what makes them unique works of art. The really neat thing about handmade rugs is that even if the same pattern is used time and time again, each rug will have its own differences with color usage and the weaver’s technique. Handmade rugs are investments which last for generations. When selecting this type of rug consult a professional to ensure that you are making a wise investment. 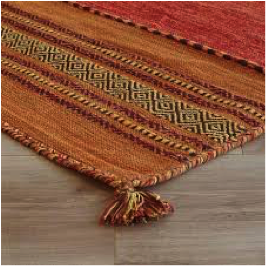 With rug weaving, whether it is handmade or machine made, there are two terms that you will continuously hear and they are warp and weft. Warp and weft refer to the yarns used in weaving of a rug. The warp yarns run the length of the rug and the weft lines run horizontal or from weft to right. (That’s some silly rug humor in case you thought it was a misspelling). The changing of yarns and/or the number of weft yarns over the warp yarns can make changes in the textures of the rug. Now that we know about warps and wefts it is important to understand the three fundamentals that all area rugs share. These include the weave, knotting and dyes. Each of these is explained in further detail below. When it comes to weaving there are three major techniques that all area rugs share. These include the pile weave, flat weave and hand tufted. Pile Weave: Most rugs are made of the pile weave or knotted weave. This is where a short yarn is tied around two warp yarns which create a knot on the surface of the rug. There are different types of knots that can be used, however all pile rugs are woven with knots. With this type of rug every knot is tied by hand and there can be as many as 25-1000 knots per square inch. What is more interesting is that a skilled weaver can tie a knot in about 10 seconds which means that they are tying 6 knot per minute. In translation, if that same skilled weaver is creating a 9×12 rug it can actually take them up to 6,480 hours with a density of 150 knots per square inch. If you have not already done the math that is 810 days or 2 years and 80 days! Now you understand why handmade rugs are both an investment in time and money. Flat Weave: Flat weave rugs are exactly what they sound like, they are completely flat. There are no knots in this type of weave. The weft yarns are just passed in and out over the warp yarns. This is also similar to how cloth is woven. Hand Tufted: Like flat weave rugs, hand tufted rugs are also made without knots. Instead the tufts (aka loops) are pushed through the primary backing of the rug. Then the primary backing is covered with a type of glue and a secondary and tertiary backing are attached. The glue and two additional backings are what hold the tufts in place. 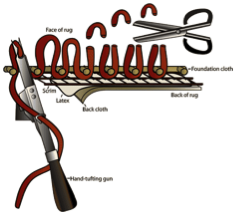 Knots come in two basic varieties with a number of different techniques behind them. The two types of knots are asymmetrical and symmetrical. The type of knotting used tells us the region in which the rug was made. Asymmetrical knots are known as Persian or Senneh. These are considered to be the finest type of knot because the weave is very fine and tight. These knots are found in Iran, India, Turkey, Egypt and China woven rugs. Symmetrical knots are known as Turkish or Ghiorde. These knots are found in rugs woven in Turkey, the Caucasus and Iran by Turkish and Kurdish tribes. The knot density is also important to understand when dealing with area rugs. The number of knots per square inch is the knot density. To determine the knot density you can count the number of knots per linear inch along the warp and weft yarns. The knots will be visible on the back side of the rug. Then you multiply the number of knots that you have counted along the warp yarns by the number of knots you counted on the weft yarns. This number can end up being anywhere from 25-1000 knots. Better quality rugs will have a higher number of knots per square inch. The final piece of the puzzle is the dyes used to change the color of wool, silk, cotton and manmade yarns. There are two types of dyes which are natural and synthetic. Natural dyes come from plants, animals or minerals. These were the only types of dyes utilized for dying rugs until the late nineteenth century. The first synthetic dyes were made due to increasing demand for handmade rugs. These dyes were introduced in Germany and then began being imported to Persia, Turkey and other Eastern countries. The synthetic dyes introduced were called aniline dyes. Aniline dyes were made from coal tar and they were bright, inexpensive and relatively easy to use. The down fall with these dyes were that they would fade when they were exposed to water or light. These dyes were banned in Persia in 1903 by Nasser-e-Din Shah to preserve the integrity and reputation of Persian rugs.